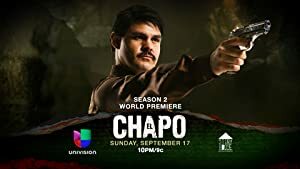 El Chapo – Season 2 (2017) – What's New on Netflix Canada Today! A look at the life of notorious drug kingpin, El Chapo, from his early days in the 1980s working for the Guadalajara Cartel, to his rise to power of during the ’90s and his ultimate downfall in 2016. This drama series chronicles the true story of the rise, capture and escape of notorious Mexican drug lord Joaquín “El Chapo” Guzmán.